There's Only 2 Choices. Which One Will You Choose? That was BA, the leader of the revolution. And he put it straight up: We have two choices: either, live with all this—and condemn future generations to the same, or worse, if they have a future at all—or, make revolution! These are our choices, sisters and brothers. You are here because some part of this spoke to you. You don’t want to accept all this. Think about this. We’ve been in town just over a week and already two people told us about close relatives who were murdered by police. A 12-year-old told us his cousin was killed for wearing red sneakers. A 15-year-old told us his father was deported not once, not twice, but three times—when the kid was five years old, eight years old, and 10 years old. A woman told us about relocating across the country so she wouldn’t be found and killed by the man she thought was her partner. Multiply these stories by thousands... and if you look around the globe, multiply them by millions. Is this any way to live? Is this the future we want for the beautiful children running around in the park right outside, and the millions like them all around the world? Those who rule over us want us to believe this is all that is possible, but that is a LIE. We can end all this, but ONLY if we end the system that is the cause of all this. Only if we make an actual revolution. This means the overthrow of this system. That’s right, we are talking about overthrowing this system—leading millions to rise up when the conditions are right to meet and defeat that violent repressive force of the old exploitative and oppressive order, to clear them away so we can build something new. No, we can’t go out and do that right now because we are serious. But we are not just waiting, we are hastening that time and preparing for it. When you watch the full film from BA, which is available at revcom.us, he will break down the strategy for how this fight could be waged with a real chance to win, and how we work now to prepare for that time. But we are not just about tearing this system down. We are about building a whole new society and world. A world where never again is an immigrant child torn from the arms of their parents, hurled across borders, or locked in a cage. Where never again does a Black mother or father have to sob over the casket of their child, shot down like a dog by the police—or by a kid from a rival set just down the street. Where never again does a woman know what it is like to fear walking alone at night because she might be attacked or raped—or to be treated like a punching bag in her own home. Where people of different genders or who love in a different way never again face bigotry or violence. Where never again is a family blown to bits by U.S. bombs dropped on Pakistan, on Yemen, on Somalia, or anywhere else on this planet. A world where the planet is cared for, not destroyed, for future generations. 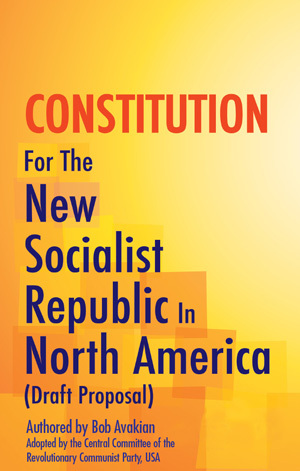 This is possible—the blueprint for this new society is right here, in this Constitution for the New Socialist Republic in North America, written by Bob Avakian. This lays out the laws, the education, the approach to culture, and more. This is a radical document; it is visionary, but it is also very concrete and real. We could live this way. All of humanity could. But ONLY if we make revolution. Again, these are the only two choices we have—accept this nightmare of a world, or make revolution. Now, you don’t need me to tell you that most people right now don’t know a damn thing about this revolution. They don’t know who BA is, they don’t know the strategy he has developed, they don’t know—most have never even dreamed about—the kind of world I just described. And many are caught up in this system’s ways of thinking, going along to get along, clawing over each other to try to survive, caught up in the way this system sets us against each other—against people of different races, from different parts of the world, with different sexual orientations, and more. We have to go to work on changing this—together. Because many millions and millions of these very same people really do care about the things BA talked about in the speech we just showed. You are not the only one. We have to break people out of all the things that keep them from the revolution. We don’t need everyone all at once. But we do need thousands—and we need them soon. Thousands acting together, influencing millions for revolution. This is why we are touring the whole country—looking for the people like you, people with real pride in being among the first to take this step that can open up a path for many others—and together with you we are going to have an even greater impact, to draw forward even more people. Then, to have an even greater impact and draw forward even more people, and again and again on a bigger scale each time. All preparing for the time—as BA gets into in the rest of the film—when we can launch the struggle for power with a real chance to win. Now, some people are going to give you a hard time. They’re gonna say all kinds of stuff about the revolution and they’re gonna attack the leader of this revolution—because they know that while we the masses of people make history, we cannot do that without leadership. They’re gonna test you and they are going to test us. Well, three things on that. Second, there are answers to these objections when people are sincere (and even when they’re not), and finding those answers is part of how you learn more. There’s nothing wrong with saying hey, I don’t know the answer right now, but you come back here next week and we’ll get into it. 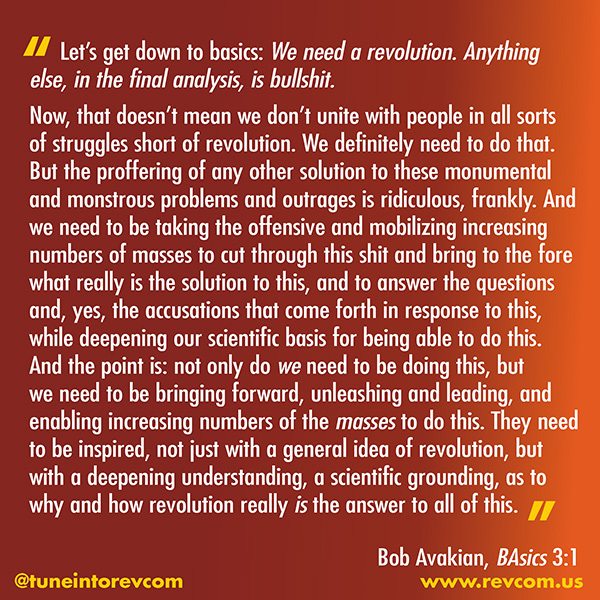 And if you run into something you can’t answer, let us know—there are many answers in this book [holds up BAsics], there are many answers on the website revcom.us, and there is all kinds of stuff we are going to have to work through together. Third, controversy can be part of how people learn. It’s the only way to lead masses of people through a process of casting off this system’s ways of thinking and taking up something new and liberating. If everyone already agreed with us, we wouldn’t need a vanguard. So, yeah, we’re gonna have to struggle real hard with people. Most people are walking around thinking they know all this stuff but they’re sleepwalking through a nightmare. And we shouldn’t be scared to let ’em know! Because millions of those very same people really do hate one or all of those “5 Stops”—the white supremacy, the attacks on immigrants, the wars for empire, the oppression of women, and the destruction of the environment—that BA talks about, and that’s why we can pry them loose from the system’s way of thinking and win them over to revolution—some all at once, a lot of them over time. But all this only happens if people like us—and I really mean that, every one of us in this room, all of you listening online, whether you’ve been into this for years or you’re hearing about it for the first time today—play a part. You don’t have to go from zero to 60; there is a role for everyone to play as you learn. You should have a form that describes six ways to contribute to this movement. Show the film of the speech from Bob Avakian, Why We Need An Actual Revolution And How We Can Really Make Revolution, to family and friends. Post the Points of Attention around school, at the laundromat, and in other places. Join the street corner rally for revolution this Wednesday at West Adams High School on Vermont and Washington at 3:15. Donate and raise funds for the Revolution Tour. Come to the Revolution Center on Thursdays and Saturdays—to watch the BA film and more. Come out running with the Revolution Running Club. Fill this out before you go—and talk with us about other ideas you have. Because if you refuse to consign children and grandchildren of today to live in this hell and worse, then you’ve got only one other choice—to join in making revolution. And there truly is nothing more meaningful or important you could be part of. With that, I want to invite you to stick around, mingle, learn more about this revolution, start raising questions or ideas, have some fun.